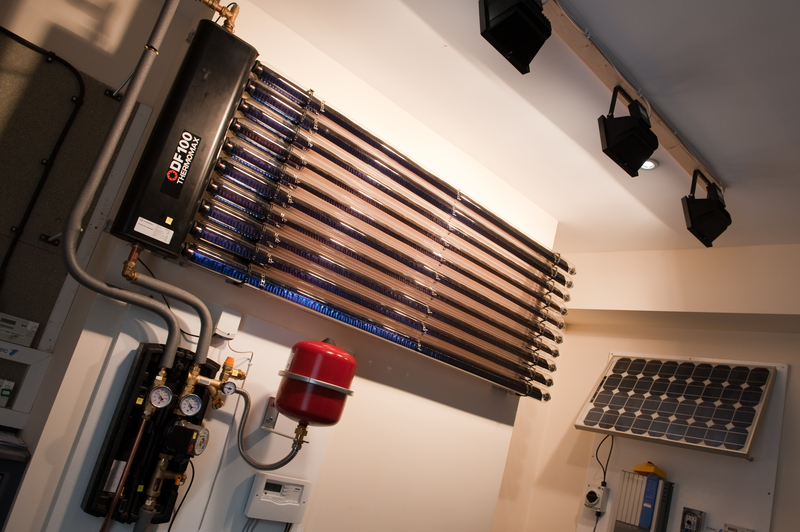 DBM Plumbing, a sole trader enterprise based in Sunderland, has been supported by the Sunderland Low Carbon Demonstration Project via renewable energy training and consultancy support. Duncan McGlen, business owner, attended the project launch event at the Stadium of Light where he learnt more about the support he and his co-workers could receive from Sunderland City Council. Following a meeting with Ed Walker of Narec Distributed Energy, Duncan decided to book members of staff on 2 different renewable technology installation courses. Duncan, who chose to attend the HETAS direct entry Biomass installer course, is a time served plumber and has some experience of biomass but before this project did not have an accredited course which would allow him to install biomass systems. Carl Bennet, who has recently qualified from his college training & apprenticeship, was put forward to attend the Logic L3 Solar Thermal Qualification. The Biomass qualification will allow Duncan to specify, install and sign off systems such as wood gasification boilers (below right). This latter phase (also called the commissioning of a system) is regularly subcontracted out by installers who can physically install a system but are not qualified to register and approve an installation. By providing a high level course such as the H005DE course, Sunderland based installers can minimise the amount of work they have to subcontract out to larger firms. Carl Bennet, also of DBM plumbing, has received support from the project through a Logic Level 3 Solar Thermal Systems installer course. As with the Biomass training, this course allows Carl to install, maintain, specify and sign off systems. Alongside this assistance, over the course of 2015, DBM plumbing is set to receive MCS (Microgeneration Certification Scheme) coaching so Duncan can successfully apply to be an MCS level installer. MCS, which is the equivalent of the Gas Safe scheme in the renewables industry, will give Duncan a nationally recognised award denoting his high standard of work and the good practices of the company as a whole. Duncan McGlen commented that the support came just at the right time for his business, explaining that the high cost of specialist training would usually prevent access. Duncan went on to talk of the quality of the training overall; ‘The courses have been fantastic, I really enjoyed the biomass course at HETAS [HETAS Training Centre at Schiedel Chimney Systems] and I think Carl has got a lot out of his solar thermal course too. The overheads for biomass are fairly high at the moment but we’re hoping to see a growth in that side of the business over this year’.